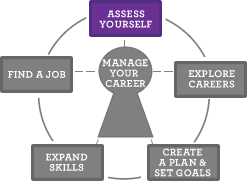 The Assess Yourself section shows you how to find job options that match your work skills, interests, and values. Do you know what it takes to manage your career? Then you are ready to assess yourself. What is self-assessment? An assessment helps you learn about yourself. There are several assessment tools provided on these pages. These tools will ask questions to help you learn about yourself and occupations that fit you. These tools will not tell you what to do. They help you explore options and decide for yourself. The need for self-assessment is lifelong. Be ready to tell employers why you are the best person for the job. Assess your Skills, Interests and Work Values. Put Your Assessment Results Together and find occupations that fit you. Explore Careers to match who you are with what employers want.